Lindt chocolate bars are beloved by chocolate lovers. With innovations flavored with coconut, pear, orange or toffee crunch, there's a Lindt chocolate Excel Bar for you. 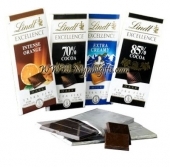 Lindt Chocolate Collection consist of 4 chocolate bars.